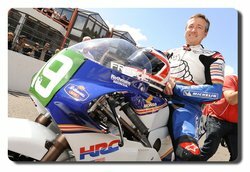 It’s official : Freddie Spencer will participate at the fourth edition of the 200 Miglia di Imola Revival which will take place on 19, 20 and 21 April 2013 on the Enzo and Dino Ferrari track in Imola. Aboard the mythical Honda RS250RW “Spencer” from 1985, owned by Richard Grantham, the American Champion will relive the most successful years of his career: three world titles and a double title in two categories in 1985 (250cc and 500cc). Chronologically, he was the last rider to accomplish this. It was also in 1985 that « Fast Freddie » took a triple victory at the Daytona 200, where he finished first in F1, 250cc and Superbike. The organisers are very pleased: « We are extremely happy to be able to share this good news with the visitors and the many fans. 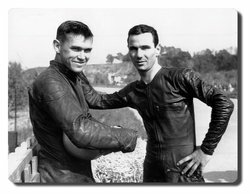 Spencer is a living motorcycle racing legend. His participation at the 200 Miglia strengthens our faith in the smooth course of this fourth edition. “This year, the organisation of the 200 Miglia has to meet some high standards, as it coincides with the 60th birthday of the track of Imola”, Christian Jupsin explains. Rich Grantham plays a fundamental role in the presence of Spencer at the 200 Miglia di Imola Revival 2013. This English entrepreneur and passionate collector of race bikes from the end of the eighties, beginning of the nineties will put his Honda RS250RW “Spencer” at disposal of the champion. 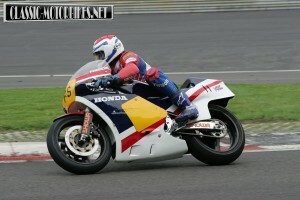 Rich himself will be present with a magnificent Honda NSR250 “Cadalora” from his collection.